Teach your children to write letter "W" and "w" (upper- and lowercase). 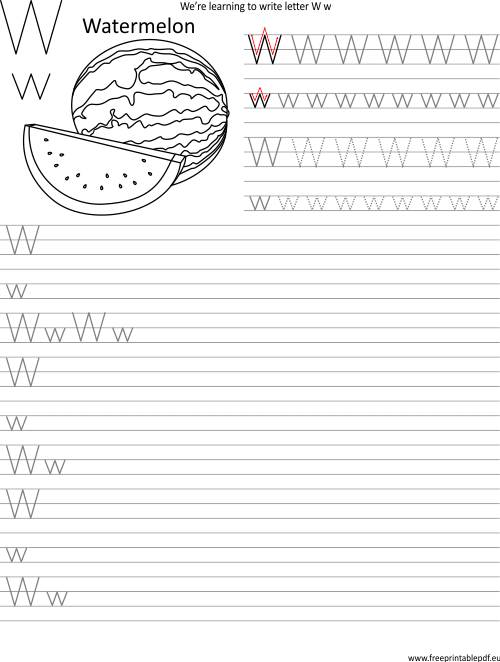 Here is a free vector pdf template with samples of writing W and w. First, the kid should trace and then write letters. It can color a Watermelon after finishing work :) Let's write W like Watermelon. How to teach your child writing the letter W? Just download and print our template. Give the worksheet to your kid and show him how to trace and write letter W by pencil. Red arrows show how to draw writing signs. This method is best for 3, 4, 5, and 6 years olds. First of all, it is an individual matter and depends on the child's personal abilities.